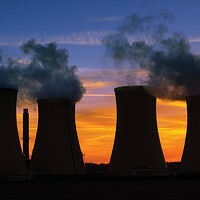 "Growth can be coming in ways that undermine your state and region"
When critics oppose environmental protections — say, federal limits on carbon emissions — they usually object on economic grounds: Cutting pollution costs jobs, they say. Such critics are often wrong, but their arguments get traction because most of us believe in economic growth, as measured by the gross domestic product (GDP). And as we've always been told, jobs mean growth, and growth means higher GDP. GDP is basically the total value of goods and services produced by a nation's economy — how much money we spend. It's been society's standard for prosperity for decades. But as even its creator agreed, as a measure of true well-being, GDP misleads: "The welfare of a nation can scarcely be inferred from a measurement of national income," said economist Simon Kuznets in 1934. GDP, for instance, fails to count desirable things, like the value of free time and clean air. It ignores harmful conditions like income inequality. GDP encourages us to deplete natural resources like freshwater without considering how fast they are renewed — or even, as with fossil fuels, that they're completely nonrenewable. In fact, undesirable but costly conditions like terminal illnesses actually boost GDP while making lives worse. So do eco disasters like oil spills. Suburban sprawl grows GDP, even as it degrades the environment and lengthens commutes. Of course, raw spending is simply easier to quantify than are quality-of-life issues. So even if money can't buy happiness, when making big decisions we act as if it's the only thing that does. 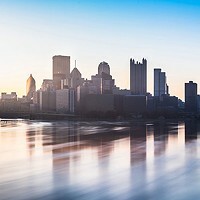 "It's possible to have the perception that your region is doing well based on GDP, but that growth can be coming in ways that undermine [your] state and region," says Matt Mehalik, of Sustainable Pittsburgh. The nonprofit group is part of the international movement to take us, as one European Commission initiative puts it, Beyond GDP. The idea is that by fully accounting in dollar terms for long-term, often "hidden" costs as well as short-term benefits, we'll make decisions that improve quality of life, instead of blindly boosting GDP. Cutting pollution, for instance, creates such economic benefits as cleaner air and healthier people. Next year, the United Nations plans to announce its Sustainable Development Goals. Even some U.S. states are forging ahead. In 2010, Gov. Martin O'Malley ordered that Maryland begin calculating its Genuine Progress Indicator, one of several available measures of sustainable economic activity. The GPI's 26 measures of well-being include GDP standbys like consumer spending. But GPI also calculates the dollar cost of things like income inequality. GPI adds the value of housework and education, and subtracts the costs incurred by crime, car crashes ... and commuting. 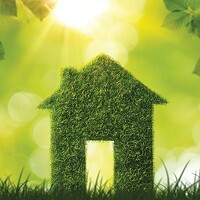 Environmentally, GPI debits things like the damage done by water, air and noise pollution, and the costs of climate change, lost forests and depletion of non-renewable energy resources. Maryland calculates that from 1960 until the mid-'70s, GPI paralleled the growth of its gross state product (GSP). After that, although per-capita GSP kept rising, per-capita GPI leveled off, reflecting factors like environmental degradation and increasing inequality; today, Maryland's GPI is less than half its GSP. 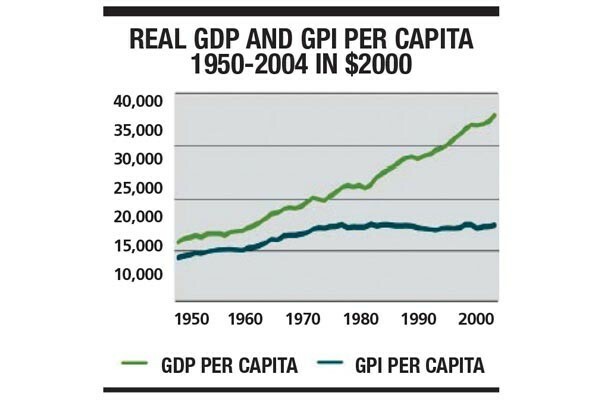 A graph tracking GPI vs. GDP nationally (pictured), from a 2006 report by the nonprofit Redefining Progress, is nearly identical. Our well-being hasn't kept up with our spending. While Vermont too tracks its GPI, the metric isn't yet formally used to guide decision-making anywhere. Still, the Seattle-based Center for Sustainable Economy is urging Maryland legislators to start including a "GPI note" on major legislation, so this new metric can begin to influence policy. Will GDP alternatives like GPI spread? Sustainable Pittsburgh has spent a decade arguing that social equity and the environment are as important as the traditional bottom line. The group's made progress, with dozens of businesses, nonprofits and local governments participating in projects like its Southwestern Pennsylvania Sustainable Business Compact. Why not a Southwestern Pennsylvania GPI? Says Sustainable Pittsburgh's Mehalik, "I think it would be very smart for our region to adopt something like that."